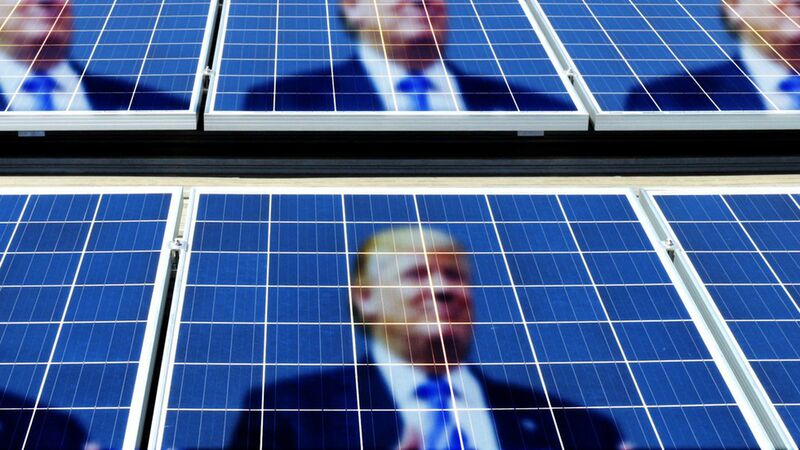 President Trump is probably going to slap tariffs on solar-energy imports if a federal trade agency recommends them, according to an administration official and other experts. "I would place the odds of the president agreeing to some type of remedy at 90%," said a Trump administration official familiar with the issue. Why it matters: Speculation has risen that the Trump administration is sympathetic to putting tariffs on solar imports after Axios reported that Trump implored his staff to "bring" him tariffs. The move, if it plays out this way, would rattle the global solar industry and give Trump a way to prove he's protecting American jobs, even if it is in in an industry he hasn't talked about much at all. What to watch: The International Trade Commission, which heard arguments for and against the issue a few weeks ago, will decide by Sept. 22 whether the U.S. industry is being "injured" (hurt economically) by cheap solar imports. If it does, it will send its recommendations to Trump by mid-November. If it doesn't, then Trump doesn't face any decision. To be clear: Trump is unpredictable (that much we can predict), and whether he faces an imminent decision depends on how the ITC rules. A White House spokeswoman said there are no announcements at this time. More predictions: "I think he will impose tariffs on imported solar panels," said David Goldwyn, a former Obama State Department official, at an event hosted Thursday by the Atlantic Council think tank. "The president wants a tariff. All he wants to use is a hammer and solar is the nail." Other experts on the panel, including Jeff Schott, a senior fellow at the Peterson Institute for International Economics, agreed with Goldwyn's take. In April, the bankrupt manufacturer Suniva, later joined by SolarWorld, petitioned the International Trade Commission for new tariffs on cells and a price floor on modules, arguing that cheap foreign imports are throttling the domestic panel industry. The wider solar industry, via the Solar Energy Industries Association, and other critics say the companies have been run poorly. They argue that granting their petition would wreak havoc on the economics of U.S. solar projects by significantly increasing the cost of components. Abby Hopper, president and CEO of solar trade group, said Thursday it was premature to make any predictions about Trump's position because the ITC hasn't issued its decision yet. She also said remedies don't necessarily need to be tariffs. Suniva, arguing that more than two dozen other companies have gone bankrupt in the past five years because of cheap imports, said in a statement it would be "very supportive" of a Trump decision in favor of tariffs.